When Can My Baby Eat Yogurt? 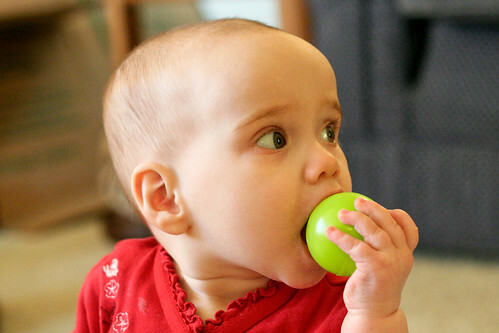 Most babies start eating solids around 6 months. When is it OK to start adding yogurt into their diet? While cow’s milk is off-limits until after the first birthday, yogurt can be included as a first food. Why? There are no worries about yogurt replacing breastmilk or formula as the primary source of nutrition in a baby’s diet. Drinking cow’s milk can send too many different minerals to a child’s undeveloped kidney and may cause problems with calcium absorption. Plain yogurt, however, is great for the immune system and makes a perfect first food, as long as there is no family or child history of dairy allergies. Plain, whole-milk yogurt may not sound good to you, but it is the right food for a baby. Kids should not be given low-fat dairy until after age 2; they need the fat in their diet. Almost all yogurts, even “fruit” varieties, have sugar or artificial sweeteners, so find a simple whole-milk, unflavored yogurt or make your own in a yogurt maker. Make sure never to sweeten yogurt with honey until after age 1, especially. Most pediatricians agree that it is OK to start this type of yogurt with babies at 6-8 months, but please consult with your pediatrician before starting anything new. Always add only one new food at a time with babies, with a 3-day wait period, to monitor for any allergic reactions. Jesus was always generous, kind, respectful, hardworking, truthful, responsible, and so much more. He’s the perfect role model for all of us – kids and adults alike! When I was a child I sometimes spent summer vacations with my grandparents, who lived in Florida. My sister and I were allowed to eat candy for dinner, sleep in half the day, and go and do wherever we wanted. The mantra was, “Anything goes at Grandma and Grandpa’s house!” We never felt like they disciplined us, but we were always anxious to please them by doing the right thing. There was just something different about my grandparents, but as a kid I couldn’t quite put my finger on it! My grandparents liked to teach us grandkids good behavior by modeling the life of Christ. They lived and spoke Scripture regularly. As a kid, I thought this was a goofy thing to do. Whoever heard of going around and quoting Scripture all the time? One day it hit me! This was their teaching style! They weren’t trying to annoy us– it was simply their “subliminal method” of teaching and reinforcing good behavior in their grandkids. My grandparents sincerely wanted to model to us how the Bible can be a real, living part of our lives. It’s not just a dusty old tome that you allow to rot on your book shelf. It’s a testament to how we should live our lives every single day. God’s Word is there to help us through our time on this Earth giving us guidance, comfort, and teaching us right from wrong. My grandparents modeled this principle numerous times to us in ways that no other believer has ever done for me. They actually modeled good character by inspiring us to be just like Jesus. There is no better way to teach children right from wrong than by showing them how to model the character of Jesus. Author and songwriter Stephen Elkins has written a great resource called I Want to Be JUST LIKE JESUS. In this fun and colorful book, stories are paired with lessons that teach about the character of Jesus. Lessons about Jesus’ character – how He was always humble, caring, hardworking, kind, honest, respectful, generous, and so much more. When applied to everyday living, we should walk as Jesus walked and live as Jesus lived! After all, HE is the perfect role model for living our lives the way God intended us to live. So, the next time the kids misbehave ask them, “Who wants to be JUST LIKE JESUS?” That’ll get their attention for sure! They’ll strive to please God which in turn will please you as a parent! You must be very patient to catch a fish! Jesus showed us how to be patient. He spent three whole years teaching people about God’s love. He was never in a hurry. He even prayed for people who did unkind things. He knew they were lost and needed His love. Jesus was “fishing” for people who would love Him back! Want to win a copy of I Want to Be JUST LIKE JESUS? We are giving away five copies. Use the Rafflecopter widget to enter! Do you remember the days when the “fall back” Daylight Saving Time meant you got an extra hour of sleep? Pure bliss, right?? Well, the time change in the fall is no picnic when you are a parent. Unfortunately our little ones do not understand the joys of another hour snuggled up in bed. So according to the new time, they will be up an hour EARLY throwing the whole day off kilter. You are not alone in this early rising tango as millions of parents will be going through the same thing. Good news for you is there are a few things that you can do to ease the transition. Founder of Dream Little One Family Sleep Consulting, Danielle Rowe, shares her five sleep tips for the daylight saving time transition. 1. Start the transition early. About 4-5 days before the time change you can slowly start shifting bedtime and meal times 15 minutes later every 2 days. (This is harder to do with children who attend school.) So if dinner is typically at 5:30pm and bedtime is at 7:00pm you would move them to 5:45pm and 7:15pm on day 1. Eventually it will end up with dinner at 6:30pm and bedtime at 8:00pm (which will be the new time of 5:30pm and 7:00pm) … and VOILA!! the transition is made. 2. Delay getting your baby out of their crib. Some babies are early risers which means they will be getting up even earlier. When you start the 15min. bedtime shift you can start delaying when you get your baby out of their crib by 15min. For toddlers and older children you can use an “Ok to wake” clock to help push back the time that they get out of bed to wake you up. 3. Use Blackout shades. So once you have established the bedtime routine you may need to work on the early morning wakings. Waking up is greatly affected by sunlight entering our room. You can use a bit of trickery for all age children (and yourself) by putting up blackout shades (or taping up black garbage bags) to block out the early morning sun. 4. Make use of sunlight. When it is an acceptable time to get up you should open all shades and let in as much sunlight at you can. Sunlight exposure throughout the day helps to set the body’s sleep rhythms. This plus social cues (such as meal time and bedtime routines) sets your child up for sleep success. Use sunlight to your advantage. 5. Be Patient! When the transition is made slowly you can gently ease your child (or children) into the time change. If the transition needs to be more abrupt you run the risk of creating an overtired child, which can be very unpleasant. Regardless of how you make the change you need to remain patient. As with any schedule change it can take a week or 2 for everything to “fall” into place. Danielle Rowe is a certified child sleep consultant with The Family Sleep Institute and the founder of Dream Little One Family Sleep Consulting. Danielle works with families to develop a customized sleep plan that best fits your child’s sleep challenge as well as your parenting style. There a variety of consultation packages to choose from to best fit your budget. She began her journey as a sleep consultant when she ran into some sleep issues with 2 out of her 3 children. It was an amazing feeling for her when they began sleeping through the night with the help of a sleep consultant. And now Danielle wants nothing more than to help exhausted moms and dads out there to get that same relief. She has a passion for teaching parents about sleep and would love to help families get the sleep they need. Dream Little One Family Sleep Consulting is your key to a better night’s sleep. Tummy time helps your baby develop muscles that help with rolling over, sitting up, and crawling. Always put your baby to sleep on her back, but she can enjoy tummy time during the day. Use a bolster or rolled up towel to prop up your baby. Dim the lights and lie down next to your baby. Shine a flashlight on the wall. Draw your baby’s attention so she can focus on the beam of light. Move the light side to side very slowly. Did your babies enjoy tummy time? Choices are important for baby development. 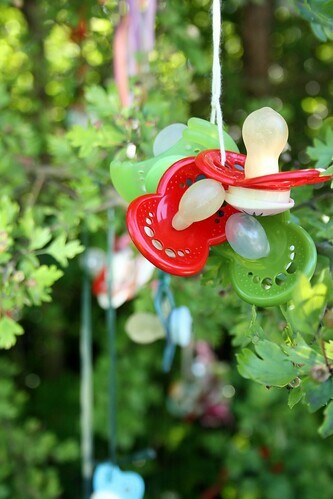 Your baby develops thinking skills as he looks at two toys and makes a choice of which one to grasp. He exercises muscles as he reaches for a toy. He remembers and develops preferences for certain objects. He begins to explore independence as he acts on those preferences. As he makes choices, he is beginning to develop decision-making skills and confidence in his abilities. Comment on what he chose: “You chose the red ball.” As he grows, offer more opportunities for him to make choices. In the future, your child will face many decisions. He will hear lots of ideas and beliefs. The ability to make tough decisions and develop spiritual convictions is rooted in these first choices. Measurements. Your baby’s length, weight, and head circumference are measured and recorded on a growth chart to observe steady growth over time. Head. The doctor will check the fontanels (the soft spots) of your baby’s head, as well as any flat spots. Ears. The doctor will observe your baby’s hearing and check for fluid or infection in her ears. Eyes. The doctor will track your baby’s eye movements, as well as look for blocked tear ducts and eye discharge. Mouth. The doctor will examine your baby’s mouth for thrush, a common yeast infection. As your baby grows and starts teething, the doctor will examine her incoming teeth. Heart/lungs. The doctor will listen to your baby’s heart and lungs to ensure that breathing and heart rhythms are normal. Abdomen. The doctor will check for hernias and enlarged organs. Hips/legs. The doctor will move your baby’s legs to detect any dislocation. Genitalia. The doctor will check for tenderness, lumps, and infection. Do you dread or look forward to well-baby visits? I feel like I didn’t mind them until my toddler was underweight … now I feel like I’m being reprimanded every time!